Oli, who has faced protests for co-hosting an event along with a church, did not attend a separate ceremony in which “Mother Moon” blessed hundreds of couples, wishing them a “blessed family” life. The names of Oli and his wife figured in the list of couples that were to be “blessed”. Hak Ja Han “Mother” Moon, the head of the South Korea-based Family Federation for World Peace and Unification / Unification Church, Sunday presented a Good Governance Award to Prime Minister K P Oli at the conclusion of the Asia-Pacific Summit 2018, which was marred with protests from Hindu groups and other political groups. The citation, which lauds Oli for “Good Governance”, along with a cheque of $100,000, was presented to the prime minister at the summit that was attended by delegates from over 50 countries. Oli said he would use the award money for the welfare of the children of Nepal. While at least four previous Prime Ministers had refused to attend the summit, Madhav Kumar Nepal, senior leader of the ruling Communist Party of Nepal, and key functionaries, attended the conference. Another former Prime Minister and party chairman, Pushpa Kamal Dahal, excused himself at the last minute, saying he had a “throat problem” and would not be able to address the delegates. The three-day Asia-Pacific Summit was organised by the Universal Peace Federation, the International Association of Parliamentarians for Peace and International Conference of Asian Political Parties. Their mother organisation is the Unification Church. 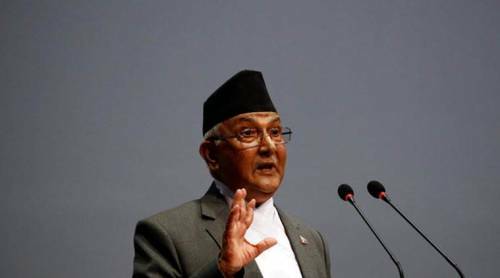 Nepali Prime Minister KP Sharma Oli’s acceptance of the $100,000 ‘Leadership and Good Governance Award’ from the controversial Universal Peace Federation at the end of the two-day Asia Paciﬁc Summit here, has raised ethical questions. Receiving the award from UPF Co-founder Hak Ja Han Moon, Oli on Sunday said he took the award as recognition of his government’s sincere effort towards ensuring good governance in the country, and the people’s long struggle and achievements. He pledged to donate the amount to a government fund meant for youths and children. However, civil society members said the government got into a ‘moral crisis’ due to its association with a controversial INGO and by accepting the award, according to a report in The Himalayan Times. Former chief secretary Bimal Koirala said if the award was given just because Nepal hosted the event without transparent selection process, it was wrong on the part of Oli to receive it. Owing to criticisms from members of the public and the controversies surrounding the ceremony, Prime Minister KP Sharma Oli has decided not to receive a ‘blessing’ from controversial Korean religious leader, Hak Ja Han. The leader’s Unification Church through its non-government organisation named Universal Peace Federation is hosting the Asia Pacific Summit in Kathmandu currently. The organisers had listed a blessing ceremony as a part of the event on Sunday. PM Oli and his wife Radhika Shakya were invited. Likewise, mayors of dozens of municipalities of the country have also decided to boycott the function after knowing that it was organised by a Christian organisation, sources inform. After the confirmation of avoidance, the session has now been changed into ‘peace and family festival ceremony’. However, Prime Minister Oli attended and addressed a session on good governance at the event venue today, according to Prime Minister Oli’s foreign affairs advisor Rajan Bhattarai.